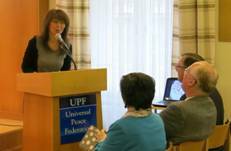 Vienna, Austria - In commemoration of the 20th anniversary of the International Year of the Family UPF-Austria hosted a conference in Vienna on May 17, 2014. The speakers included Mag. Josef Missethon, a business consultant and family therapist; Mag. 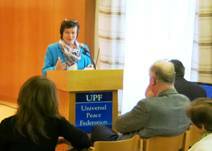 Maria Neuberger-Schmidt, author of several educational books and founder of the “Parents’ Workshop” organization; Dr. Zhannat Kosmukhamedova working with the motto “Prevention is a family issue” at the United Nations Office on Drugs and Crime; and Dr. Peter Amann, a family therapist. Mag. 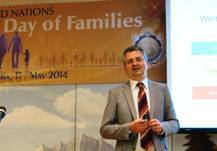 Josef Missethon spoke about how the value system within the society influences families in their everyday lives: “Values are like stars. They might be unreachable, but when darkness comes they guide us on our way.” The value system creates a certain attitude towards life, and the attitude is reflected in the actions one takes. He also talked about the various roles one takes up during one’s lifetime, such as being a parent and/or fulfilling one’s responsibilities in a profession at a working place. Finally he explained about the government’s goals for the families in Austria: Equalization of burdens between families with and without children; avoidance of physical, psychological and sexual violence in the family context; strengthening the competence of fathers and mothers; compatibility of family life and job responsibilities; and strengthening children and youth in becoming self-reliant. Mag. Maria Neuberger-Schmidt addressed current family policies in Austria, which she described in this way: “Recently family politics have complied with the reality of families but have not given any guidelines or goals. There is a broad consensus on patchwork-families as well as a discussion on homosexual couples raising children, but no one seems to ask the children what they would prefer themselves.” In a TV discussion Mrs. Neuberger-Schmidt raised her voice for the father-mother-child family, which brought her discreditation and even persecution afterwards. She then stated: “Politicians should help all families alike, regardless which state they are in, but on the level of society we have to acknowledge that children need a father and a mother." 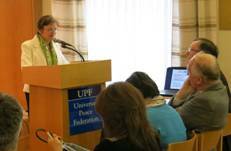 Dr. Zhannat Kosmukhamedova spoke about the father’s role in child education. The father is the one who enlarges the intimate circle of the mother-child relationship, thus introducing the child into the wider society beyond the sphere of the family. He is usually the one who teaches strategic planning and is the partner to play games, thus supporting the further socialization of the child. 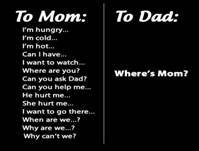 Building a society begins with the father: he is the one who permits and prohibits. When such functions are discouraged, society runs wild, justice is not respected, the teachers are not listened to, the police are under attack, etc. As Dr. Zhannat works in the field of drug abuse and crime prevention, she spoke about the importance of healthy families and explained her organization’s program for the prevention of drug use, HIV/AIDS and crime among young people through family skills training programs. The key points of the UNODC’S approach are: Violence prevention, avoiding maltreatment and aggressive behavior in children, improve problem-solving and other cognitive abilities and social development in kids, increase retention in school, and improve learning achievement. Mag. Elisabeth Cook led a lively discussion and a session of questions and answers. 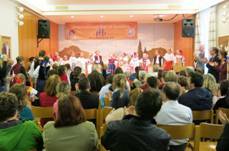 The highlight of the event was then a performance of the Slovakian children’s folk dance group Rozmarin. 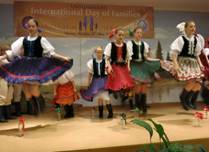 Twenty-five children aged 5-15 performed dances and demonstrated what family is all about as they were accompanied by their parents, grandparents and their brothers and sisters. 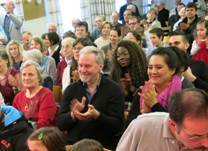 The audience was uplifted by the spirit created by the music and the excitement of the children and youngsters performing in front of such a big crowd. Afterwards everybody enjoyed the food from the buffet which concluded the event. 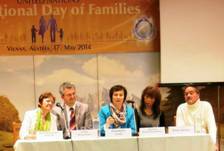 The International Day of Families is observed on the 15th of May every year. The Day was proclaimed by the UN General Assembly in 1993 with resolution A/RES/47/237 and reflects the importance the international community attaches to families. 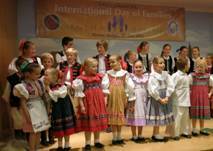 It is celebrated at the United Nations headquarters and around the world. 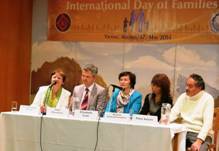 The Universal Peace Federation joins in commemorating this day because it considers the family as a microcosm of the global community and because sustainable peace is grounded in the family as the most intimate social unit, the school of love.